The Kurukulla puja will occur on December 9th. Kurukulla is one of the main manifestations of feminine principle–enlightened wisdom enacting magnetism. Kurukulla practice is performed to bring beings to the dharma and also to draw mutually positive relationships, energy, and wealth to our household as well as to our spiritual and work endeavors. In Shambhala, Kurukulla is also invoked to draw inspired and interested beings to the tradition of warriorship. December 10th is the Sakyong’s Vajrakilaya puja. Vajrakilaya is part of the tradition of wrathful compassion, practices that awaken the mind of ultimate fearlessness to overcome obstacles. Vajrakilaya was most famously accomplished by Padmasambhava at the Yang Le Sho cave in Nepal just before he arrived in Tibet. Padmasambhava’s practice was credited with ending both a drought and an epidemic. Vajrakilaya practice is generally done to overcome unseen obstacles, things that undermine the ability to engage positive activities or lead a virtuous life. 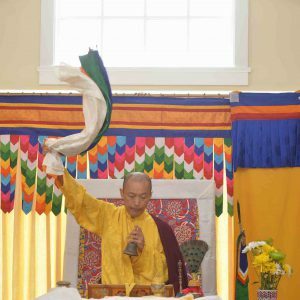 The Sakyong has said that this puja will be used to reawaken and encourage the connection to primordial confidence and compassion. This will be helpful at this time when many beings are feeling scared, discouraged, and worried.